Drawn and Quarterly, 9781770462793, 436pp. APPEARED ON BEST OF THE YEAR LISTS FROM NPR, WASHINGTON POST, PASTE, AND MORE! Marking a departure from the author’s celebrated first-person travelogues, Delisle tells the story through the perspective of the titular captive, who strives to keep his mind alert as desperation starts to set in. Working in a pared down style with muted color washes, Delisle conveys the psychological effects of solitary confinement, compelling us to ask ourselves some difficult questions regarding the repercussions of negotiating with kidnappers and what it really means to be free. 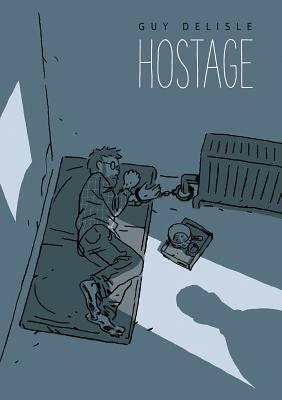 Thoughtful, intense, and moving, Hostage takes a profound look at what drives our will to survive in the darkest of moments. Guy Delisle was born in Quebec City, Canada. His bestselling and acclaimed travelogues (Pyongyang, Jerusalem: Chronicles from the Holy City, Burma Chronicles, and Shenzhen) are defining works of graphic nonfiction, and in 2012, Delisle was awarded the top prize in European cartooning when the French edition of Jerusalem was named Best Album at the Angoulême International Comics Festival. He lives in France with his wife and children.